Queensbury NY residents are fortunate to have access to hundreds of miles of bikeways, trails, walkways, and preserves that offer opportunities for the novice biker and hiker to the more advanced adventurer! Open to the public from dawn to dusk for non-motorized recreation only and are carry in/carry out facilities. Gurney Lane Recreation Area: This Queensbury park offers opportunities to enjoy the outdoors all year long. Over 13 miles of mountain biking trails from easy to difficult offer fun and challenging obstacles like hills, uneven terrain, rocks, and stumps. There are 4 miles of casual hiking nature trails and another mile of easy family hiking trails that are well-maintained for the use of strollers and wagons. All trails can be used for cross-country skiing and snowshoeing as well. VanDusen Preserve (Queensbury): Hiking and snowshoeing at Queensbury Land Conservancy’s (QLC) off of West Mountain Road offers great opportunities for observing wildlife. The trail is well-marked and maintained, and is a 1 3/4 –mile round trip to the top of West Mountain. Offers views of Queensbury and Glens Falls NY. 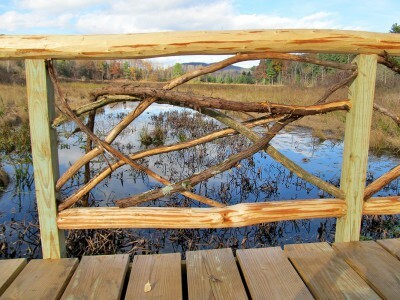 Rush Pond Trail (Queensbury): A 2.6-mile trail that runs right through the Rush Pond wetlands connects West Mountain Road and Fox Farm Road. Great for walking, mountain biking, and snowshoeing! This trail also links the Gurney Lane Recreation Area to the neighborhoods off of Aviation Road. You will enjoy fabulous opportunities to view wildlife in the wetlands. Meadowbrook Nature Preserve: Interpretive signs teach you about habitats, plants and animals as you walk, hike, mountain bike, cross-country ski or snowshoe through this 2.5-mile nature trail system. Hudson Pointe Nature Preserve: 83 acres provide 3 miles of interpretive trails perfect for walking, hiking, mountain biking, cross-country skiing and snowshoeing. For more information on hiking trails in Queensbury NY and Warren County, call Queensbury Parks & Recreation at (518) 761-8216. Warren County Bikeway: A 9.4-mile paved trail connecting historic Feeder Canal Towpath Trail in Glens Falls and Battlefield Park in Lake George NY. No dogs or motor vehicles allowed on the trail. Feeder Canal Towpath Trail: An easy 9-mile one-way trail in Glens Falls that follows the original 1820’s canal system. Fifth Peak Trail via Brown Mountain: A 5.8-mile, one-way trail for more experienced bikers, requiring uphill climbs and technical skill in Bolton Landing NY. Northwest Bay Trail: A 5-mile trail for more experienced bikers requiring some technical skill due to rocks, roots, and narrow points. Lake George Recreation Park: 4 miles of beginner, intermediate, and advanced trails for bike enthusiasts. 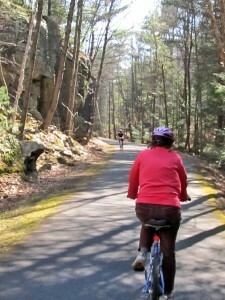 For more information on biking trails in Queensbury NY and Warren County, call Queensbury Parks & Recreation at (518) 761-8216 or visit www.bikewarrenco.org.